Fairy tales are told and re-told so often that it is difficult to imagine a contemporary version finding success, unless there is some quirky or fresh twist on the original text. 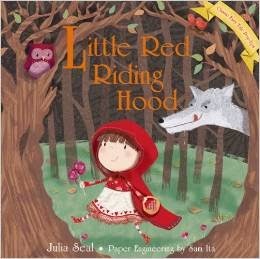 This is, however, not the case with Seal's Little Red Riding Hood. The text isn't nearly as as quirky or original as I would like (though I have an admitted predilection for the unexpected and strange). But what really wins me over about this version of LRRH are Seal's illustrations combined with 'Paper Engineer' Sam Ita's pop-up creations; they are sweet, vibrant and lively. The charm of this book is that it convincingly creates that eerie other-worldly atmosphere that one should expect when it comes to fairy tales. The text by itself is, arguably, bland. That being said, it is cute, and tamer than other versions I have come across, making it a more relaxed and enjoyable experience for the littlees. But the real winner is the skilful fusion of Seal's illustrations with Ita's paper magic - it is easy to lose yourself in this book. Don't buy this book for the story, but do buy it for the immersive experience.